The Drivers of Change app is informed by a very rigorous process of interviews, research and workshop analysis alongside input from Arup’s global network and broad spectrum of experts. The Drivers of Change system is organized by topic and by STEEP lens (Social, Technological, Economic, Environmental, Political). Each driver contains an open ended question, a relevant fact, an invoking image, a synopsis, and information diagrams. Visually mapping the system helped create a clear picture of the Drivers of Change structure and to help us think about how we will translate the content from a physical card/object into a digital experience, that does not have the limitations of "sides". On the other side of the digital system is the user. Since Drivers of Change can be used for multiple purposes (activism, academic, business) we used persona types to define how people would get into the system, what types of tools would help engage them, and how might they share their experiences with others. Drivers of Change is a unique system that helps inspire and engage people. In translating that to a navigational system we were inspired by systems thinking and Buckminster Fuller's dymaxion mapping. After sketching out typical navigation systems we floated toward a less traditional model that shows the interconnectedness of the topics, as they overlap at points anyways (eg "oceans" can be seen as a subset of "water", etc). After the launch of Drivers of Change we discovered that 20% of users were using the app on tablets. This included Arup Americas using it as a business development and recruitment tool and universities. 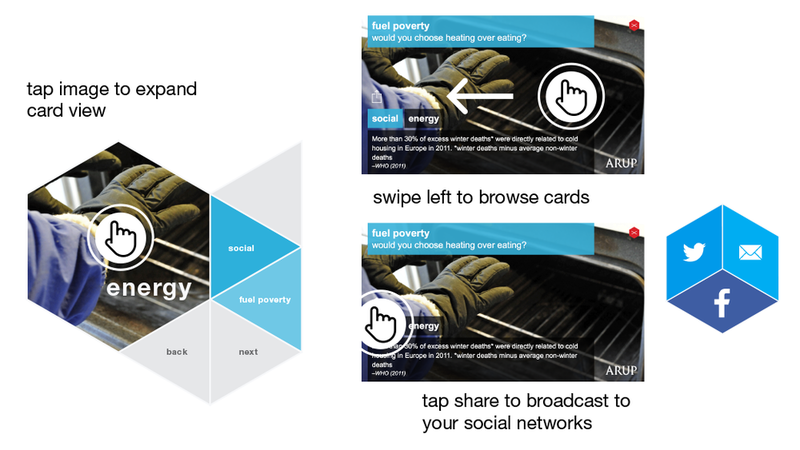 We created a optimized experience for larger screens this extends the usage of Drivers of Change as an interactive component in Arup office lobbies, conferences, and for external use.